This tutorial will explain the basics about using Maperitive. We will go through the user interface, load some map data and then make a nice map image that you can then use in other software. Note: if you haven't done it already, please read the Two Minutes Introduction To Maperitive and then return back here. 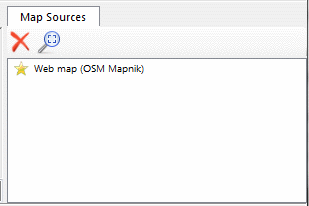 The Map Sources window shows the list of data sources that your map uses. Initially, it's just a single web map. It is basically a "ship's log" of what goes on in Maperitive. Initially it says something like "Running the default script...". You see, when started, Maperitive runs a default script that loads a web map as a source. You can run other scripts, too, but more about that in later tutorials. By holding the left mouse button and dragging the mouse, you move around the map. Scrolling the mouse wheel is one way of zooming in our out of the map. If you want to zoom to a certain map area, press the Shift button, followed by the left mouse button and then drag the mouse to draw a rectangle on the map. Once you have released the left mouse button, Maperitive will zoom into the rectangle you have drawn. Using the browser, go to OSM map, choose a smallish area (let's say the size of a few city blocks) and then click on the Export tab. Select the OpenStreetMap XML Data radio button value, click on the Export button and you'll receive a file called map.osm from the server. Using JOSM, you can download a small area (again, the size of a few city blocks) and then save it to disk. You can download pre-made OSM extracts from http://download.geofabrik.de/ or http://downloads.cloudmade.com/. Make sure you choose OSM XML file, .osm.bz2 or .osm.pbf file. Again, choose some small country (or part of a country) for the purpose of this tutorial. To really see the vector map in action, we will now hide the web map. You can do this by clicking on the yellow star beside the web map in the Map Sources window. The star will turn gray, which indicates it is now hidden. Change the "line-color : white" line to "line-color : red" and save the file. Now look back at the map. Your residential streets should now be in red (you might have to zoom in close enough to see it). Now undo the changes in the rules file - red streets look ugly. Now that we have explored the basics of map styling, we can visit one of the other important functions of Maperitive: exporting maps so that they can be used in other programs, be printed or published on the web. Although you can export the map into various forms, in this tutorial we will cover only exporting into bitmaps. Exporting the map is actually quite easy: move the map to the area of your choice and select the Tools | Export To Bitmap menu command. What you see on the map will be directly exported into a file called output.png on your disk (the full file path will be shown in the Commander window). This is the simplest scenario for exporting, but the export-bitmap Command has many parameters that allow a lot of control of how the exporting gets done. But I'll leave this for another tutorial.